Vivienne Whiffen has had connections with Andalucia since 1963 when her father moved here. After a few years in Copenhagen, and in England (where she went to art college to study photography in the 90s), she moved to Gaucin in 1993 where she was a founding member of Art Gaucin. She now lives in Estepona but travels for much of the year, mainly on a boat! She has had a number of both group and solo exhibitions and works independently, producing high quality editions of 10 or 20 prints, until recently doing all the printing herself. Her favourite subjects? She works both in b/w and in colour, preferring b/w for street photography and people in context, colour for her more abstract works. For an exhibition at Artsenal in Malaga last year, she produced giant colourful photographs on vinyl to hang in a huge space! 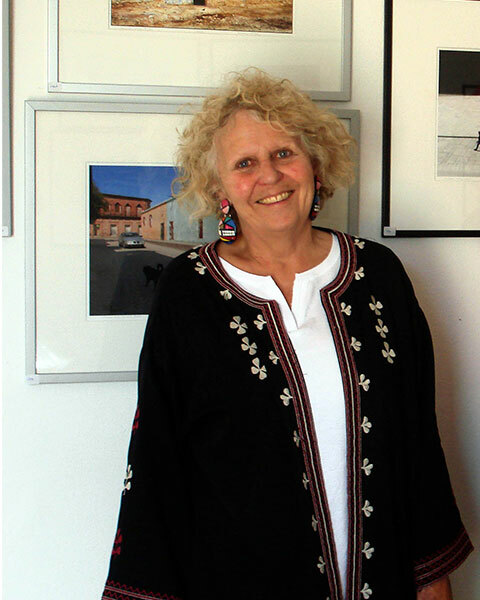 She has had an open studio at the Art Gaucin Open Studios event for the last eleven years, and for the past several years has also exhibited at NADFAS (now The Arts Society) in Benahavis.